As you all know the season has started, with our first guests coming in and out of Beho Beho, the surroundings are starting to change from a lush green to their drier shades, as the dry season creeps ever closer. But it still remains an absolutely beautiful spectacle for us here, as we look across the open savanna plains to the prominent Tamarind tree each day, to see how many giraffe or other game we can spot. Karin and I did our first trip off the African continent before coming back to Beho Beho to open up camp, and as you know it’s a massive continent with so many magical places, however it was time to explore further afield. So off to the UK we went, and then taking us all around Italy seeing all the sites, and yes, you guessed it a little bit of the Italian Wild thrown in. We went looking for the Marsican Brown Bear, classified as the most highly endangered species of bear in the world today, with only an estimated amount of 50 individuals left. And something that has been on my bucket list to see was wolves, in this instance European Wolves. We were very fortunate to see both on our adventure there, and were equally overwhelmed and ecstatic. However, there was something else I wanted to see as well, which I had read about and talked about, but had yet to see it and at least get a photograph of it. And this we had to go to the Natural History Museum in London to find it. 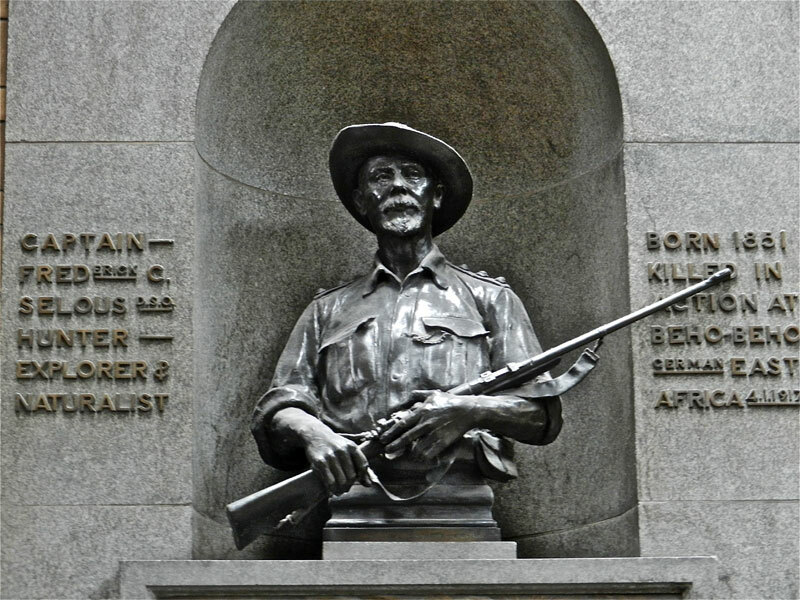 No it wasn’t the dinosaurs that I was looking for, but none other than the bust of Selous, Captain Frederick Courtenay Selous, the person the Selous Game Reserve is named after. And there as you come up the stairs on the left side of the museum was the bronze bust of Selous, and inscribed on the left side – Capt. Frederick C Selous, Hunter, Explorer and Naturalist – and on the right – Born 1851, killed in action at Beho Beho, German East Africa, 4 January 1917. As some of you would know, and others coming to visit will soon find out, very close to Beho Beho camp, is the battlefields, where Captain Selous was shot in battle, his grave positioned just on the outskirts, where his remains still lie today. A very interesting character and man to read about, as he explored Africa from the age of 20, travelling from South Africa into Zimbabwe, and up through the different coutries of this awe-inspiring continent. He then only joined the British Army when he was 63 to fight in WW1, then German East Africa, now Tanzania. His will was strong and determination even stronger, and gained quick respect from the Germans, in particular General. Paul von Lettow-Vorbeck, the only undefeated German commander in WW1. Even more so from his on men that he lead in the 25th Royal Fusiliers, which often struggled to keep up with his pace. Born in England, he had always dreamed of Africa, and from a young age, knew he would eventually find his way there and explore the continent he would eventually die in. So it was another thing on my bucket list ticked off. And now, back in the Selous, ready for the adventures and great sightings the Selous has to share and offer. This entry was posted in History, Walter and tagged Beho Beho, camp, Frederick Courtney Selous, safari, selous. Bookmark the permalink.